GALION — Colonel Crawford’s Chad Johnson won the Division III race at Saturday’s district cross country meet at Amann Reservoir. His time of 15:22.32 helped the Eagles to a second-place finish in the boys race and a team berth in next week’s regional race at Tiffin. The Colonel Crawford girls also qualified for the regional meet as a team, finishing fourth in their Division III race in Galion. 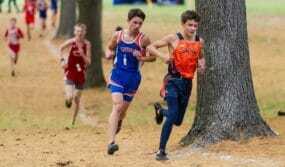 No other local runner advanced to the regional meet, but Galion’s Braxton Tate was close. In the Division II boys race, Tate placed 20th, in 17:27.07. The top 15 runners qualified. See more photos from the meet at Amann Reservoir in our online gallery. For the Crawford boys, Johnson has made a habit of winning in Galion, also posting victories in the County Meet, the Galion Cross Country Festival and the district meet for two years running. He was first again Saturday, but two of his teammates were right behind him. Nick Studer placed fifth in the same race, in 16:55.15 and Brad Bauer was eighth, in 17:10.22. The Eagles scored 86 points, finishing behind first-place New London, which scored 83. Also running for the Eagles were Braxton James (30th in 18:27.85) and Wade Hopkins (42nd in 18:50.90), Alex Mutchler (19:19.06) and Zach Leonhart (19:37.37). In a Division III girls race, Colonel Crawford qualifed as a team with 93 points, good for fourth place. In front of them were Huron, 61 points; Norwalk St. Paul, 70; and Hopewell-Loudon, 86. The race winner was Crace Moser of Huron, in 19:39.87. In the Division II boys race, Tate was joined by Lucas Conner (42nd in 18:17.35), Luke Eisnaugle (56th, 19:13.65), Spencer Guinther (59th, 19:33.55), Garret Murphy (60th, 19:38.11), Weston Ross (19:50.76) and Colin McCullough (23:23.09). Lexington won the race, with just 27 points. The winner of the Division II boys race was Owen Krewson of Sandusky Perkins, in 15:48.14. In the Division II girls race, Sari Conner was the best finisher for Galion. She was 39th overall, in 21:47.41; followed right behind by Megan Zeir (40th, 21:47.65). Also running were Ashlie Sallee (69th, 23:54.53), Lauren Huggins (71st, 24:16.33), Murissa Windbigler (72nd, 24:33.13), Abby Barre (25:28.65) and Theresa House (26:47.68). Lexington won the girls Division II race with 43 points. The individual winner was Lexington’s Olivia Wolfe in 18:55.11. Lexington had the top three finishers in the race. Crestline ran in a separate division III race on Saturday in Galion. For the boys, Kaleb Carver finished in 19:13,17; Trenton Gray finished in 21:55.54 and Wesley Patrick turned in a time of 24:29.37. In the second Division III girls race, the Bulldog’ Caitlyn Harley turned in a time of 22:32.80.